Almost foolproof. And I’m the acid test for that. Having recently purchased an enameled cast iron Dutch Oven (oven review here), there was now the problem of, what to do with it? 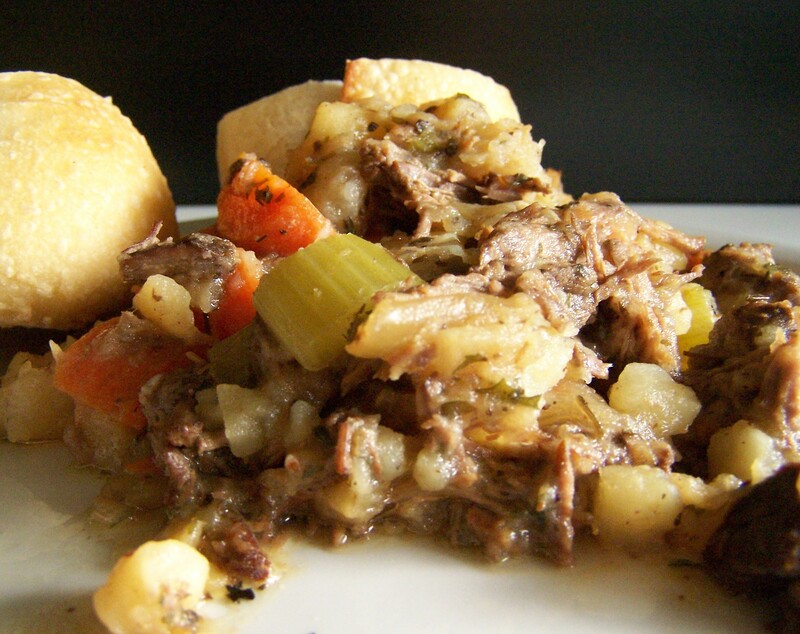 Pot roast is the classic solution for Dutch oven cooking. So here goes. Trim any excess fat from the meat. Season the meat with salt and pepper on both sides, Add oil to the dutch oven. Over medium-high heat, brown the meat in the dutch oven for about 5 to 10 min each side. Add the apple juice to the dutch oven. Reduce the heat, cover and simmer for about 30 minutes. Add the garlic and onion. Continue to simmer for another 60 minutes. Add the potatoes and turnips. Continue to simmer for 45 additional minutes. Add the carrots and celery and salt. Simmer for an additional 30 minutes. Mix in the basil, parsley and rosemary. Simmer for an additional 15 minutes. At this point the meat should “fall apart” when lifted with a fork. If not, additional cooking may be needed. Turn off the heat. Remove the meat from the pot to a serving dish or bowl. With two forks, pull apart the meat into shreds. Spoon out the vegetables and place over the meat. Deglaze the pot with the remaining liquid (or add a half cup of liquid if needed, wine is traditional) by raising the heat to medium, gently scrapping the browned bits and pieces sticking to the inside of the pot with a safe (not metal) nylon or wooden spatula or spoon. Stir and allow to boil for a few minutes. Turn off the heat and pour the liquid over the roast. The cooking times here will yield soft vegetables. For firmer vegetables, let the meat simmer longer by itself before adding the vegetables. Keep the total cooking time the same, as the meat will need it. The vegetables are added at different times so that the quicker cooking vegetables don’t over cook. The exact cooking time will vary depending on the size and cut of the meat used. This example used two pieces of round steak about 10 inches long, 4 inches wide and about 3/4 inch thick. In general, the larger the piece of meat, the more time is needed. The meat is done when it falls apart when lifted or picked at with a fork. Low and slow is the key to good pot roast. By keeping the temperature of the meat relatively low throughout the whole cooking cycle and cooking for a long time, the connective tissue of the less expensive cuts of meat breaks down allowing the meat to be “fork-tender”. That’s also the secret to good barbecue. By using a gentle simmer and a tight-fitting lid, you won’t need much liquid to cook the meat. However, make sure you don’t run the pot dry. At the start of cooking and at the various places you add the vegetables, take a peek at the liquid. Make sure there’s enough liquid in the pot and the liquid is still at a gentle simmer. Add additional liquid if needed. Do you need to go out and buy a Dutch oven to make this recipe? The answer is, probably not. With careful regulation of the heat and a good lid, other pots would probably work. That experiment is left to you. But then, why a Dutch oven? The answer is, it’s worked for centuries. So don’t mess with a good thing. Although there are many theories, my theory is that the mass of the cast iron helps make up for our mistakes trying to keep the heat constant. This entry was posted on 12/04/2011 at 10:00 and is filed under Recipes, Recipes, food, cooking and related items. You can follow any responses to this entry through the RSS 2.0 feed. You can leave a response, or trackback from your own site. I made this recipe last weekend and was so delicious that I went to the market and bought another roast to cook tonight. I couldn’t find this recipe for a while when searching Internet… Glad I found it again and made sure to save and print it this time. Yes, the longer I slow cooked the roast on a low flame in the apple juice, the better as just makes the meat and fat more scrumptious!